Pop your email address into the form below, click submit, and we'll do the rest. You'll automatically be notified by email when Library Research Service publishes new Fast Facts reports. In September 2010, the Colorado State Library (CSL) secured a $3.3 million Broadband Technology Opportunity Program (BTOP) grant including $2.3 million in federal funds, $754,000 from the Bill & Melinda Gates Foundation, and $316,234 in matching and in-kind donations from local libraries, CSL, and community organizations. This grant funded 50 grantees to build or enhance Public Computer Centers (PCCs) in 88 high-need urban and rural communities with high poverty rates, ethnic diversity, low broadband penetration, and/or limited access to public computers. The CSL BTOP project has positioned Colorado’s libraries to effectively partner locally and regionally, while CSL staff have coordinated statewide efforts for public libraries to be instrumental in creating greater workforce development opportunities for Colorado’s job seekers. Regional Workforce Centers are located in urban and more populated areas of Colorado. These workforce centers provide a variety of free services to assist both employers and job seekers, including access to online job listings, computers, and high-speed internet. Job seekers can obtain career counseling and training, while employers have access to worker recruitment services such as pre-screening, referrals, training reimbursements, and tax credits. The Colorado Rural Workforce Consortium (CRWC) is comprised of the Colorado Department of Labor and Colorado Workforce Centers and “was formed to meet the collective needs of Colorado’s rural communities relating to workforce vitality.”8 The CRWC consists of 11 workforce regions covering 52 rural counties in Colorado. However, 20 of these counties do not have a workforce center, and the consortium recognized that it needed to devise alternate solutions for providing services to them.9 With 83 public libraries located in the CRWC regions (38 of which are BTOP libraries), libraries were perfectly positioned to team up with the CRWC to help create and implement the Virtual Workforce Center at the Library. Virtual Workforce Center at the Library (VWFC) provides dedicated workforce stations at libraries with a virtual connection to the nearest Regional Workforce Center. This statewide partnership funded thirty rural libraries to receive equipment and software for computer workstations dedicated to career and economic development. The VWFCs are scheduled to “go live” in fall 2012. Many other partner libraries that are not receiving computer equipment are still benefitting by participating in VWFC training and accessing the VWFC’s YourWorkForceCenter.com portal, an online gateway for patrons who are looking for jobs, business owners who are seeking employees, and residents needing social services. VWFCs are designed to bring many of the services found at regional workforce centers to employers and job seekers in remote and rural areas. Whereas many public access computers at libraries have a 30- to 60-minute limit per session, the dedicated VWFC workstations allow patrons to use the computers for the time necessary for completing online job applications. By co-locating the library’s technology resources and the Workforce Center’s career development resources inside of the library’s physical space, VWFCs are able to provide patrons with enhanced access to computers, high-speed internet, and the YourWorkForceCenter.com portal, as well as assistance from Workforce Center staff and library staff—all without having to drive to a distant Regional Workforce Center. Since some workstations will be equipped with a camera, microphone, and an ISDN video line, patrons will even be able to make appointments for virtual face-to-face counseling sessions with Workforce Center staff. There are plans for many VWFCs to offer training sessions for job seekers on creating resumes, preparing for job interviews, and much more. For those who live far from regional offices, the VWFCs are powerful and accessible resources for improving employment prospects. In 2011, BTOP sites offered 22 classes on business development and 93 classes on job seeking, including those for the VWFC program. As comments on class evaluations show, these computer training classes met the needs of a variety of participants, including job seekers looking to improve their resumes or perform better on job skills tests, as well as employed patrons looking to update or improve their job skills. For more information about CSL’s BTOP project, visit http://coloradovirtuallibrary.org/btop/. ALA defines a challenge as an attempt to remove or restrict materials, based upon the objections of a person or group. 2011 was a fairly typical year for the number of challenges reported, with 60 falling slightly below the 10-year average of 69 (see Chart 1). Books were the most common type of item challenged (63%), followed by videos (28%). Only 1 Internet challenge (information about a library’s matching grant from the Gay and Lesbian Fund) was reported in 2011, marking a change from 2010, which saw Internet challenges rise and book challenges drop. In 2010, a number of requests to have materials unblocked from filtering software were reported; though this was expected to mark the beginning of a trend in rising challenges to computer resources, these challenges were largely absent in 2011. 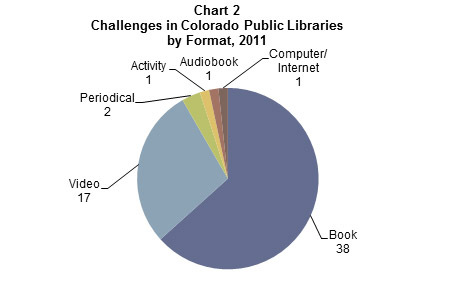 Two periodicals, 1 activity (a Dungeons and Dragons club), and 1 audiobook were also challenged in 2011 (see Chart 2). Most of the items (77%) challenged were adult items. Just 9 were young adult (YA) items, and 5 were children’s items, numbers more or less consistent with previous years (see Chart 3). One book was removed from Colorado public libraries in 2011. The title was The Two Babylons or Papal Worship Proved to be the Worship of Nimrod and His Wife, and the basis for removal was that the book relies on faulty research and incorrect information and is also widely available online. Most items (83%) saw no change in status. Another 3 items were moved to a different section of the library; 1 was given new subtitles (the American subtitles apparently being less explicit than the Japanese version of the video); 4 others were either undecided at the time of reporting or not reported by the library; and 1 challenge was dropped by the patron (see Chart 4). LibraryJobline.org, an online resource maintained by the Library Research Service (LRS) at the Colorado State Library, lists job postings from employers in Colorado and beyond.14 Library Jobline dates back to 2007, offering 5 years’ worth of statistics about Colorado’s library job climate. An analysis of Library Jobline statistics over time, in conjunction with data gathered from the Bureau of Labor Statistics (BLS), the American Library Association (ALA), and Library Journal, indicates slight improvements to the library job climate in 2011. This Fast Facts addresses these improvements as they pertain to the number of job postings, full-time positions, and starting salaries, and provides current job seekers with reason to feel cautiously optimistic about their quests to find library jobs. In 2011, more than 500 employers and 1,600 job seekers—223 of whom joined in 2011—were registered with Library Jobline. Almost two-thirds (63%) of those job seekers were signed up to receive email notifications of new job postings, and another 656 job seekers (39%) had opted into a custom RSS feed to stay abreast of the latest library job opportunities. Library job seekers can also monitor Library Jobline postings via Twitter; in 2011, @LibraryJobline had accrued 224 followers. 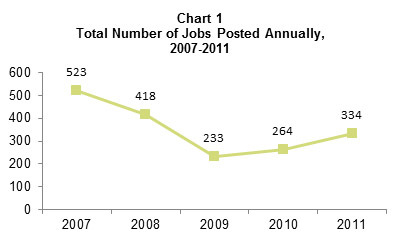 Since bottoming out in 2009, the number of annual Library Jobline postings rose 43 percent in 2011, from 233 to 334 (see Chart 1). March, May, and June saw the most job postings, or an average of 35 new jobs per month, whereas January, September, and November were the worst months for job seekers, with an average of only 19 new postings per month. As compared to previous years, the monthly average of 26 postings per month is the highest since 2008, which saw an average of 35 new jobs per month. The number of times that Library Jobline postings were viewed overall decreased slightly in 2011, from an all-time high of 728,024 in 2010 to 651,599—a difference of 10 percent (see Chart 2). In addition, the number of views per job posting also dropped by almost 30 percent, from an average of 2,757 in 2010 to 1,951 in 2011. While this shift could signify a healthier job market, in which fewer people are looking for open positions, it might also be attributed to the rise in the number of Library Jobline users who receive news about available positions via customized emails, RSS feed, or Twitter, rather than by accessing those postings directly from LibraryJobline.org. *No job view data is available for 2007. Across all 2011 Library Jobline postings, one third (33%) required applicants to have an ALA-accredited Master of Library and Information Science (MLIS) degree or Master of Library Science (MLS) degree. Another 12 percent of jobs preferred candidates who had an MLIS or MLS degree. 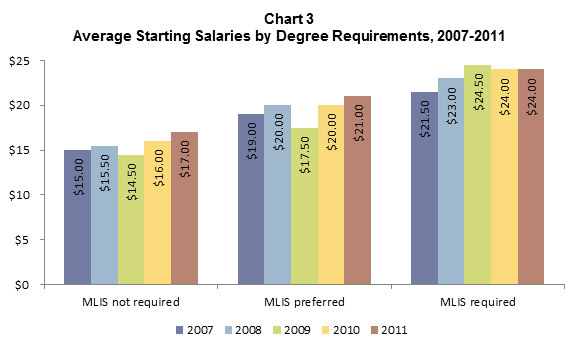 The remaining 54 percent of job postings did not require an MLIS or MLS degree. Entry-level library job seekers may be relieved to know that in 2011, only 1 in 4 Library Jobline postings specifically required 1 or more years of library experience, and only 1 in 5 stated experience as a preference. More than 80 percent of employers did not require professional-level library experience, and 11 percent listed professional-level experience as a preference. Just 1 in 10 postings (38 in total) required 1 or more years of supervisory experience, while another 11 percent preferred it. More than one-fifth (22%) of all 2011 postings gave preference to candidates with Spanish-language skills, and 2 percent made Spanish a requirement. While just over half (53%) of job postings in 2010 were full-time positions, nearly 62 percent of 2011 postings to Library Jobline were for 40-hour-per-week positions. Only 21 postings, a mere 6 percent, were for temporary positions. In 2011, the average starting salary for professional positions was $24 per hour, which was equal to the starting salary for professional positions in 2010, but still down from the $24.50 average in 2009 (see Chart 3). Wages for positions which did not require an MLIS continued to climb for the third year in a row. In 2010, the median annual wage for a librarian, according to BLS,15was $54,500 annually, or an hourly rate of $26.50. Whereas data from the 2010 ALA-APA Salary Survey16 (the most recent year available) shows an average starting salary of $48,317 annually, or $23.23 per hour. For recent LIS graduates—notably not all librarians—Library Journal’s “Placements & Salaries Survey 2011”17 reports an average starting salary of $42,566, or $20.46 per hour. Although these data points are valuable in evaluating current and potential salaries for librarian positions, caution should be exercised in comparing them to each other or to Library Jobline data, as they represent different data sets and geographic areas. Data collected from Library Jobline shows modest improvement in 2011 for Colorado’s library job market, as marked by an increase in job postings. Starting salaries for positions that required an MLS/MLIS remained stable, and they improved slightly for those jobs that did not require an MLIS. While restoring hope for both library job seekers and employers, this information demonstrates that despite some signs of recovery the job market has not fully recuperated. As part of the Common Core of Data (CCD) program, the National Center for Education Statistics (NCES) releases a report each year on public elementary and secondary schools in the U.S. that includes staffing and student enrollment numbers.18 In 2004, these reports began providing the number of full-time-equivalent (FTE) public school librarians nationwide and for each state. NCES (http://nces.ed.gov/) is the primary federal entity for collecting and analyzing data related to education. A professional staff member or supervisor [as opposed to support staff] assigned specific duties and school time for professional library services activities. These include selecting, acquiring, preparing, cataloging, and circulating books and other printed materials; planning the use of the library by students, teachers, and instructional staff; and guiding individuals in the use of library books and materials maintained separately or as a part of an instructional materials center. Librarians are categorized as “instructional and student support,” a group which also includes instructional aides, instructional coordinators and supervisors, guidance counselors/directors, other library support, and student support services staff. All together, this group represented 15 percent of public school FTEs in 2010-11. Both the state and national numbers of school librarians have steadily declined since the 2007-08 school year, when the total number nationwide was 54,385 and Colorado’s number was 851. 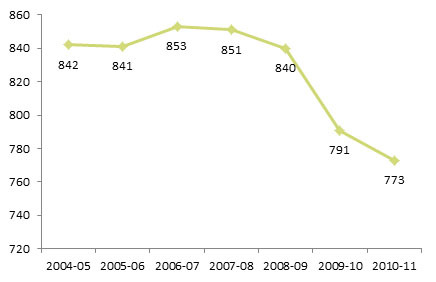 This decline marks a contrast from the relatively stable staffing period of 2004 to 2007. The exact figures for each year since 2004 are shown in Charts 1 and 2. While the number of librarians decreased from 2007 to 2011, the number of students in schools rose. From the 2007-08 to the 2010-11 school year, the total number of public school students increased by 2 percent nationwide (from 48,515,020 to 49,484,181), while the number of librarians decreased by 8 percent. In Colorado, the gap is more pronounced, as the total number of students rose by 5 percent over this 4-year period (from 801,867 to 843,316) while the number of school librarians fell by 9 percent. This is a disturbing trend, as research over several decades has linked school librarians with student achievement. With fewer librarians employed in this sector—and more students—school librarians’ efforts will likely become diluted, thus limiting their ability to help students. Additional information about school librarians’ impact on student achievement can be found on LRS’s School Library Impact Studies web page at http://www.lrs.org/impact.php, as well as in the Scholastic report School Libraries Work! (http://www.scholastic.com/content/collateral_resources/pdf/s/slw3_2008.pdf). 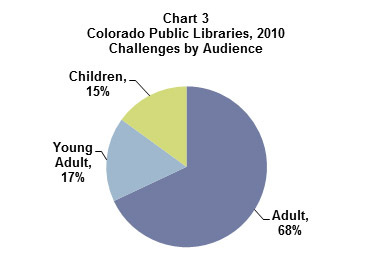 Among numerous other statistics, both the Colorado Public Library Annual Report (PLAR) and the Public Libraries Survey (PLS), a national report published by the Institute of Museum and Library Services (IMLS), gather and publish information about the number of staff, librarians, and ALA-MLS librarians working in public libraries in the state and the nation. Librarians: Persons with the title of librarian who do paid work that usually requires professional training and skill in the theoretical or scientific aspects of library work, or both, as distinct from its mechanical or clerical aspect. ALA-MLS Librarian: Librarians with master’s degrees from programs of library and information studies accredited by the American Library Association. All Other Paid Staff: This includes all other FTE employees paid from the reporting unit budget. According to the 2010 PLAR,19 approximately 59 percent of Colorado’s public library jurisdictions employ at least 1 person with an ALA-MLS degree.20 Of the 67 libraries that reported employing an ALA-MLS librarian, 4 reported having less than 1 full-time ALA-MLS position. 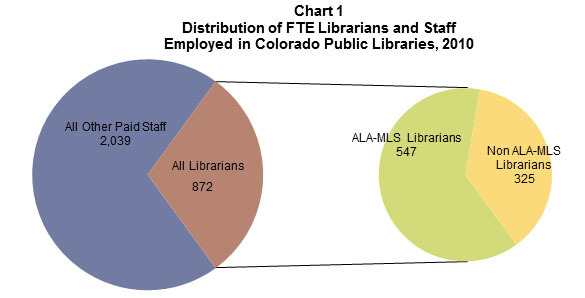 As measured in full-time equivalents (FTEs), more than 6 out of 10 librarian positions in Colorado’s public libraries are staffed by ALA-MLS librarians (63%), and nearly 1 in 5 of all staff positions (19%) (see Chart 1).21 Looking back over time, these figures have remained relatively stable; on average, since 2005, ALA-MLS-certified librarians represented 63 percent of FTE librarians working in public libraries, and just under 19 percent of the public library workforce in general. Thus, it seems that external forces, such as the recession, have had little bearing on the proportion of ALA-MLS librarians versus non ALA-MLS librarians working in Colorado’s public libraries. However, the data does not shed light on the issue of part-time versus full-time positions and their relative rise or fall. The 2009 PLS data published by IMLS reported that 4,464 of 9,225 U.S. public libraries had ALA-MLS librarians.22 Thus, less than half of all public libraries in the United States employ at least 1 ALA-MLS librarian (48%). Colorado bests this average, but ranks only 24th nationally, falling behind other states in which greater percentages of public libraries employ ALA-MLS librarians. 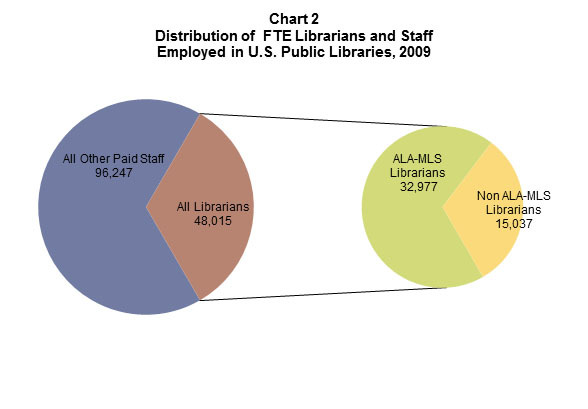 Also according to the PLS data, U.S. public libraries employed more than 144,261 FTE staff, 48,015 of whom were classified as librarians (33%) and 96,247 as other paid staff (67%) (see Chart 2).23 Nearly 7 out of 10 librarians had an ALA-MLS degree (69%) and approximately 1 in 5 of all staff had these credentials (23%). In terms of the percentage of public libraries employing ALA-MLS librarians, and also the ratio of ALA-MLS librarians to other staff, Colorado is more-or-less on par with national trends. Of course, whether a library can hire ALA-MLS librarians is largely a matter of economics, location, the availability of accredited applicants, and other factors. Yet, the distribution of librarians with and without ALA-MLS degrees is an issue critical to libraries and the profession of librarianship. 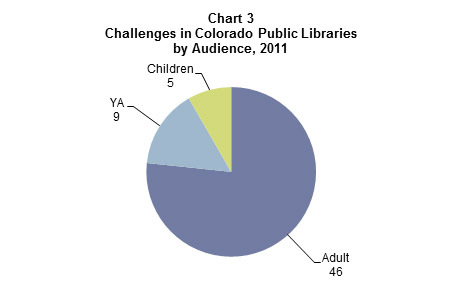 The Public Library Annual Report (PLAR) is a survey of all public libraries in Colorado. Visit LRS.org to obtain PLAR data and to read more Fast Facts about workforce trends in Colorado libraries. Public Libraries Survey (PLS) data can be found on the IMLS website at: http://www.imls.gov/research/default.aspx. What is the Value of an MLIS to You? In May 2011, librarians, library staff, and library school students weighed in on the LRS 60-Second Survey The Value of an MLIS Degree to You. Almost 2,500 people from every state and 15 countries, representing all library types, responded. Around 1,300 respondents left comments, sharing additional thoughts on the value of the MLIS degree today. What is a 60-Second Survey? In the style of an online readers’ poll, LRS’s 60-Second Surveys are short and to the point. Narrow by intent, these surveys capture the perceptions of respondents on a single timely topic. 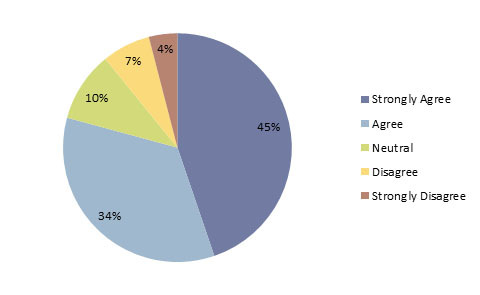 The online surveys are publicized through local, regional, and national library listservs, blogs, etc., and as a result most respondents have some connection to the library profession. Respondents who have had their MLIS degree the longest were more likely to indicate that the time and money invested in the MLIS was worth it (see Chart 2). Nine out of 10 (92%) respondents who have had their MLIS for 16+ years strongly agreed or agreed that the degree was worth the investment. Almost 90 percent of respondents who have had their degrees for 11-15 years strongly agreed or agreed that the investment in the MLIS degree was worth it, as did 80 percent of respondents who have had their degrees for 6-10 years. While around two-thirds of newer professionals felt that their investment in the degree was worthwhile, they were less likely to strongly agree and were more likely to be neutral or disagree. Respondents who completed their degree 1-5 years ago were the most likely to indicate that the degree was not worth the time and money they invested in it. Survey respondents also indicated whether or not they would recommend pursuing an MLIS degree if asked today. Almost two-thirds of respondents (63%) would recommend pursuing the MLIS degree, with one-fourth of respondents indicating they would “highly recommend” the degree (see Chart 3). Close to 1 in 6 respondents would not recommend pursuing the degree, and 7 percent would actively dissuade others from pursuing it. Around 14 percent of the respondents said that they were not sure if they would recommend the degree if asked. MLIS content: Any reference to MLIS (or equivalent) degree programs and curriculum, including knowledge and skills and/or the need to supplement with additional degrees or experience. Career advancement: Any reference to the ability to advance in a library career, including the degree being a requirement. Job market: Any reference to the availability of professional positions for MLIS holders and the ease or difficulty in obtaining those positions. Personal financial impact: Any reference to the cost of the degree and the salaries earned post-degree. Intrinsic value: Any reference to personal values and beliefs related to working in the profession. Perception of the profession: Any reference to the public’s or government/policy makers’ view and/or appreciation of librarianship. 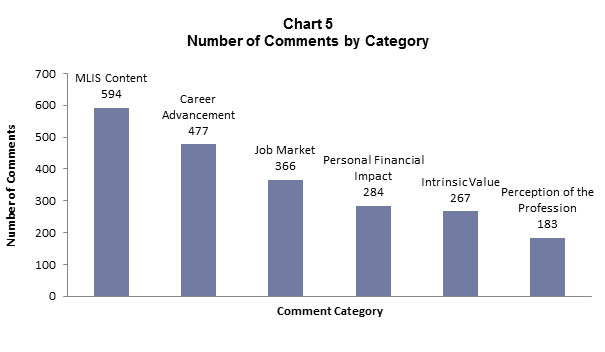 Comments were also coded as positive, negative, or neutral/mixed in tone (see Chart 6). Respondents commented predominantly negatively on the job market, the cost of the degree, and the perception of the profession, but they were more upbeat about the degree’s intrinsic value and possibilities for career advancement. Comments relating to MLIS content were the most ambivalent in tone. For a more detailed analysis of this survey and respondents’ comments, as well as a comparison to LRS’s 2008 Value of an MLIS survey, see the Closer Look Report at: http://www.lrs.org/documents/closer_look/MLIS_Value_Closer_Look_Report.pdf. AskColorado (www.askcolorado.org), a statewide virtual reference service, was launched on September 2, 2003. Colorado libraries joined the cooperative as members to provide 24/7 chat reference service to Coloradans. Over the years, the cooperative honed in on 3 essential and high-use entry-points for patrons: K-12, General, and Academic. These entry points remain today. In 2008 the cooperative’s academic libraries voted to accept academic members from outside the state of Colorado; and in 2010, the academic queue was re-branded as AskAcademic and a separate website was launched (www.askacademic.org). AskColorado and AskAcademic are funded with contributions coming directly from the member libraries and federal funds provided by the Colorado State Library under the Library Services and Technology Act. Responses show that the majority of AskColorado users are pleased with the service and are likely to be repeat users (see Chart 1). Four out of 5 users (80%) rated AskColorado librarians as “very helpful” or “helpful,” and 6 out of 7 users (85%) said that they would be “very likely” or “likely” to use the service again. Responses to the question “To what extent are you satisfied with the answer(s) to your question(s)?” were similarly positive: More than three-fourths (77%) of AskColorado users were “very satisfied” or “satisfied” with the answers they received. Compared with previous evaluations of AskColorado, in 2011 the service received the highest ratings yet on the questions of librarian helpfulness, future use, and overall satisfaction. Satisfaction was even higher among AskAcademic users. Nearly 9 in 10 AskAcademic survey respondents indicated that the librarians who assisted them were either very helpful or helpful (89%), and most (86%) were either very satisfied or satisfied with the answers they received to their questions. Answers to a question about the likelihood of using AskAcademic again were even more enthusiastic, with 94 percent of respondents saying that they were “very likely” or “likely” to utilize the service again (see Chart 2). The surveys also asked respondents about what they achieved by using the service. Respondents could select multiple answers to this question. 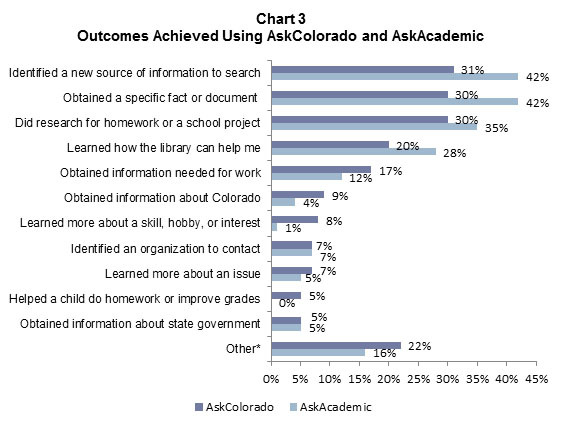 The most popular outcomes for both services were to “identify a new source of information to search” (31%), “obtain a specific fact or document” (30%), and “do research for homework for a school project” (30%) (see Chart 3). *“Other” responses included assistance with job searches, e-readers, and other library services. Survey data gathered from 2004 to the present shows that Coloradans are consistently and increasingly pleased with the virtual reference service AskColorado. In its first year of evaluation, AskAcademic performed similarly well. Respondents’ comments further underscored the value users place on these services: “[The AskColorado librarian] did her best with a difficult research problem and found information in a few minutes that took me months!” concluded one user. The 2010 Public Library Annual Report (PLAR) produced by the Library Research Service and the 2010 ALA-APA Salary Survey published by the American Library Association-Allied Professional Association both provide windows into the compensation earned by library professionals. Both the PLAR and the ALA-APA Salary Survey collect and publish salary data about similar library positions (see below), and classify libraries by size according to the same guidelines.25 Yet, the 2 reports vary significantly in other respects. The ALA-APA Salary Survey draws data from a sample of libraries nationally, and reports this information at the national, regional, and state levels, whereas the PLAR takes its data from a census of Colorado public libraries. Despite these differences, looking at the 2 reports side-by-side yields insights about the spectrum of salaries for public library professionals in Colorado and nationally. The ALA-APA Salary Survey is a national survey conducted to ensure that librarians, and those who hire librarians, have accurate and timely salary data. Information about the methodology, as well as additional data and findings, can be found in the 2010 ALA-APA Salary Survey available at: http://www.alastore.ala.org/.The LRS survey data from the 2010 Public Library Annual Report data may be accessed in its entirety at www.LRS.org. Comparing national data averages, librarians in medium and large libraries make less than librarians in very large libraries, but the difference is fairly small for non-supervising librarians, managers/supervisors, and department heads (see Chart 1). There is a difference of less than 15 percent between the medium and very large libraries within these job categories. For example, managers/supervisors in very large libraries make 8 percent more than managers in medium libraries. However, for assistant directors and directors the variance is much greater, with directors making two-thirds more in very large public libraries than in medium libraries (68%). • Non-Supervising Librarians: Librarians who do not supervise. • Manager/Supervisor: Individuals who supervise staff in any part of the library but do not supervise librarians with MLS degrees. • Department Heads, Coordinators, Senior Managers: Individuals who supervise one or more librarians with MLS degrees. • Associate Directors: Individuals who report to the Director and manage major aspects of the library operation. • Directors: Chief Officers of libraries or library systems. Several patterns emerge from this data (see Chart 2). For one, the differences between low and high salaries, across all positions, are more drastic in very large public libraries than in medium and large public libraries. For example, in medium public libraries, high-end salaries for managers/supervisors are 30 percent higher than low-end salaries, and in large public libraries, high-end salaries for managers/supervisors are 36 percent more than low-end salaries, whereas in very large public libraries, this difference is the most extreme, with managers/supervisors at the high-end of the scale earning more than twice as much as non-supervising librarians. 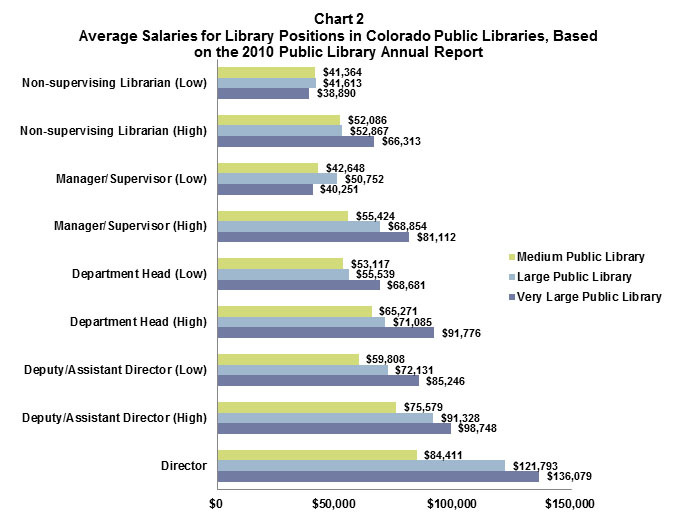 Comparing professional salaries in medium, large, and very large public libraries across Colorado, pay rates in very large libraries generally trump those in medium and large libraries. Yet, this trend is not true of low-end salaries for librarians and managers/supervisors, who tend to earn more in medium and large public libraries than in very large public libraries. Despite obvious differences between the PLAR and ALA-APA Salary survey data, some comparisons between the two are inevitable. These show that, on average, directors in Colorado tend to make less than directors nationally. Salaries for other library positions in Colorado are more evenly matched to the national averages, with the mean salaries for the nation generally falling between the average high and low salaries in Colorado. 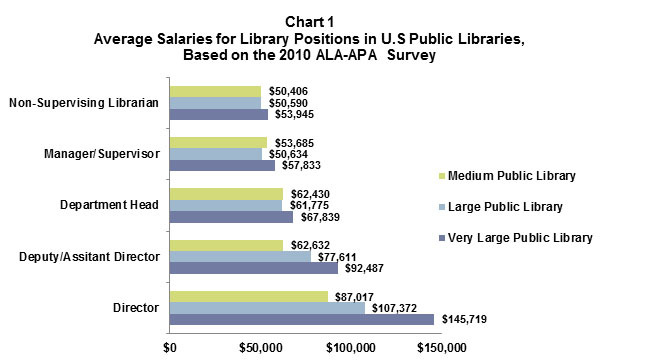 The 2010 PLAR and ALA-APA Salary Survey data also show that in Colorado and across the nation, library professionals in very large and large public libraries tend to earn more than their peers in medium public libraries. Each year, the Library Research Service (LRS) collects data from Colorado’s 114 public libraries and presents it in the Public Library Annual Report. 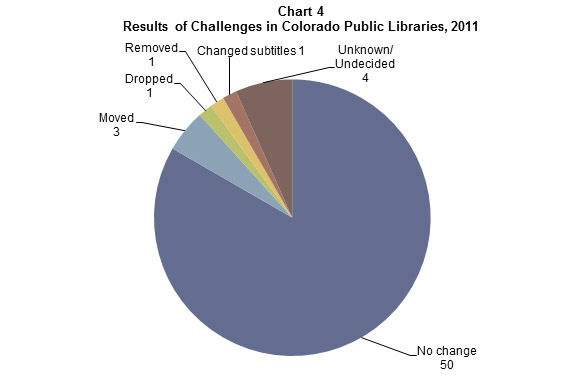 Among this data is information about which items were formally challenged in Colorado’s public libraries. In 2010, 20 libraries reported challenges, and 19 of those libraries responded to a follow-up survey detailing the reasons for 66 of those challenges. No title was challenged more than once. This report looks at 2010’s challenges, including the format and intended audience of the items and the actions taken by the libraries in response, as well as the total number of challenges reported annually in the last decade. The American Library Association defines a challenge as “an attempt to remove or restrict materials, based upon the objections of a person or group.”For a list of the challenged titles discussed in this report, see: http://www.lrs.org/documents/plstat10/challenges_details_10.pdf. 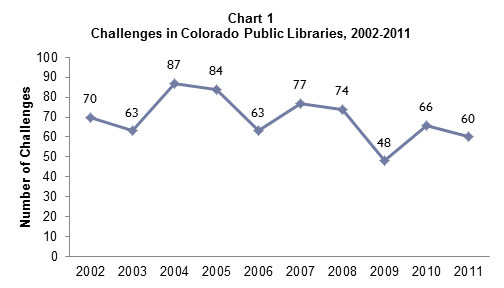 The number of challenges reported in Colorado in each of the past 10 years has fallen between 48 and 87, averaging 69 titles per year (see Chart 1). As seen in the next section, however, the formats being challenged are changing. 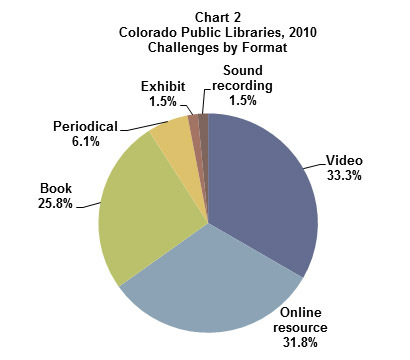 Videos and online resources each received more challenges in 2010 than books (see Chart 2), a departure from the past 9 years, which all saw books receiving the most challenges. The dramatic increase in online resource challenges is due to many requests for adult sites to be unblocked from filtering software, which all came from 1 library. Challenges to periodicals challenges decreased slightly from 2009, while sound recording and “other” challenges (in this case a single exhibit) remained comparable with previous years. The top 3 reasons for challenges in 2010 were requests for sites to be unblocked by library filtering software, unsuitability to age groups, and sexual explicitness (see Table 1). Several items were challenged on the basis of more than one reason, accounting for the discrepancy between the sum of the frequencies and the 66 total challenged items. Historically, sexual explicitness, unsuitability to age group, and offensive language have been the most common reasons for challenges. Most (68%) challenged materials in 2010 were adult materials, and young adult (YA) and children’s materials were just about equally represented in the remaining 32% of challenges (Chart 3). Over the past 10 years, adult materials have been challenged most frequently (usually falling near 50%), followed by children’s then YA materials. 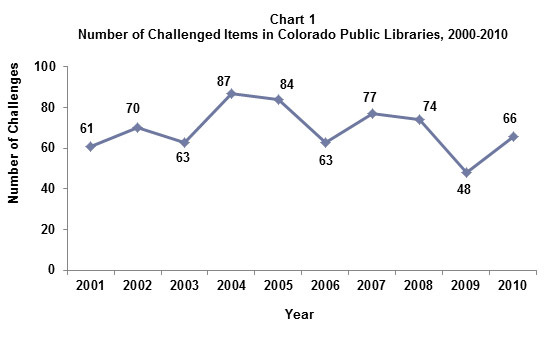 No items were removed from library collections due to challenges in 2010. As in previous years, most challenges (88%) this year resulted in no change in the item’s status (Chart 4). Nine percent of the challenges were dropped by the patron, 2% resulted in the item being moved to a different section of the library (i.e., 1 video was moved from children’s to YA), and just 1 item elicited an apology from the library and the re-placement of a sticker that was blocking content on a DVD case. 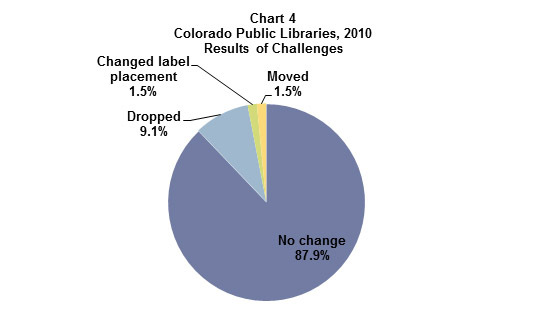 Based on data Colorado public libraries have reported to LRS, 2010 was a typical year for challenged materials: an average number of challenges were reported—mostly adult materials—and nothing was removed from Colorado’s collections. The one notable change in 2010 data is the increase in challenges to videos and websites, marking a shift away from book challenges. As library collections evolve beyond books, we can expect patrons’ attention and concern to shift towards online content and videos as well. Colorado libraries send an estimated 5.9 million items annually via the courier system. Compared with the costs of using a commercial shipping service, they save up to an estimated $7.1 million per year by using the courier. 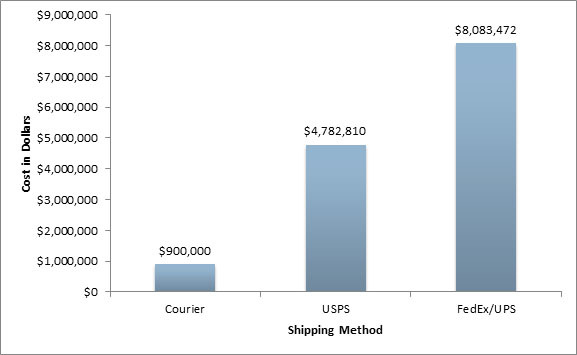 To update these results, the Library Research Service (LRS) conducted a study in Fall 2011 to determine the quantity and type of materials that libraries were sending via the courier system, and then to estimate, based on these numbers, the system’s cost effectiveness versus using a commercial service. All courier libraries were asked to participate in the study by tracking their courier use for 1 week, either September 26-30 or October 3-7, 2011. During this time period, 372 libraries were part of the courier system, 284 of which were eligible for participation in the study.27 A total of 193 (68%) of these submitted data. The data reported by the participating libraries was extrapolated28 and annualized to estimate the total number of materials shipped per year for all 284 libraries. The results indicated that there was a high volume of traffic moving through the courier system: an estimated 5.9 million items annually. As Table 1 shows, more than two-thirds of these items were books (68.7%), followed by DVDs (16.0%), audio books (6.7%), and music CDs (6.2%). “Other” materials (VHS tapes, etc.) made up just 1.5 percent of the traffic, and copies/correspondence and packages accounted for less than 1 percent each. An estimated 25,320 of the total number of materials (less than 1%) were courtesy returns. The estimated total weight for these materials—which was calculated by using the average weights for each material type (books, DVDs, etc. )—was 2.5 million pounds. LRS then calculated the shipping costs—which are based on weight—if libraries were to use USPS Library Mail, FedEx Ground, or UPS Ground29 instead of the courier system. Based on these annualized estimates, the courier system saves Colorado libraries millions of dollars each year (see Chart 1). The statewide courier costs $900,00030 annually for all 284 libraries, whereas USPS’s library mail service would cost an estimated $4.7 million, and FedEx Ground/UPS Ground31 would cost more than $8 million. 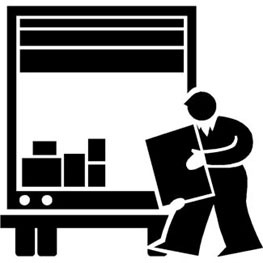 It is important to note that the cost savings realized by using the courier service extend beyond the shipping fees. If libraries used a commercial service, they would also incur costs for packing materials (e.g., boxes, bubble wrap, shipping labels, tape, etc.) and the additional staff time needed to pack the materials. In contrast, materials are packed in bins to be shipped via the courier service, meaning that minimal packing materials and less staff time are required. This study demonstrates that Colorado libraries experience significant cost savings by using the statewide courier. By providing a cost-effective means for transporting materials, this service enables libraries of all sizes to share items from their collections, and enhances the number and types of resources available to patrons. It is important to remember that the numbers presented here are estimates. The annual figures are calculated based on data provided by a sample of courier libraries during a 1-week time period. There is a fair amount of diversity among the courier libraries that might not have been fully captured by the sample of libraries that chose to participate in the study, as well as fluctuation in traffic patterns from week to week. Therefore, the actual figures for materials transported and commercial shipping costs may vary a bit in either direction. However, it is reasonable to conclude that the courier saves Colorado libraries millions of dollars in shipping costs each year.